(Newser) – Facebook's CEO may have earned a paltry $1 salary last year, but he still doesn't come cheap. The world's biggest social media network increased spending on Mark Zuckerberg's security by 50% in 2017, paying over $7.3 million to keep him safe, the Guardian reports. 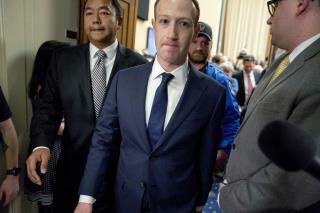 The money was needed "due to specific threats to his safety arising directly as a result of his position as our founder, chairman, and CEO," Facebook told US regulators. "Facebook Pays $7.3M for Extra Zuckerberg Need" See people are misunderstanding this headline. It's actually saying that facebook had to spend $7.3M because they needed an EXTRA Zuckerberg. They needed to build a new one for redundancy. In case something happens to any or all of the others, they need to make sure they always have one fully-functioning unit. Aint it incredible that FB etc live off advertising. The majority of advertising doesn't inform anyone of anything new, it just indicates how proudly stupid, dull and vain most people are.. I wouldn't be paranoid, if everyone didn't pick on me!